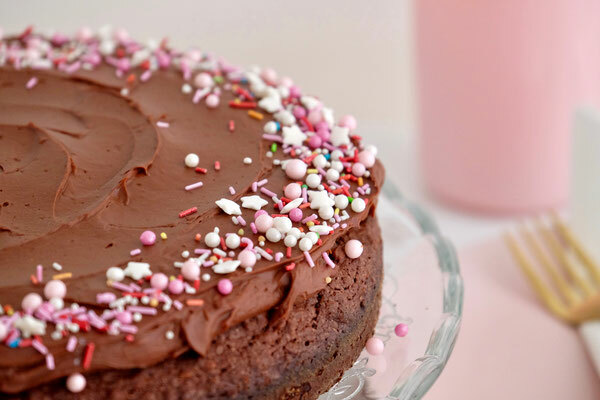 When you see the picture above, with those beautiful pink and red sprinkles and the pink plates, you could assume that I baked this delicious, frosted chocolate & coconut cake specifically for this upcoming Valentine's Day! I haven't though - I just LOVE the combination of chocolate and coconut, whether it's in cake, cereal or candy. And pink (or rather blush) is my favourite colour, so when it came to decorating this yummy treat, the choice was easy: white stars, pink pearls and colourful non-pareilles it is! But back to the cake - this is a must for any lover of chocolate and coconut. 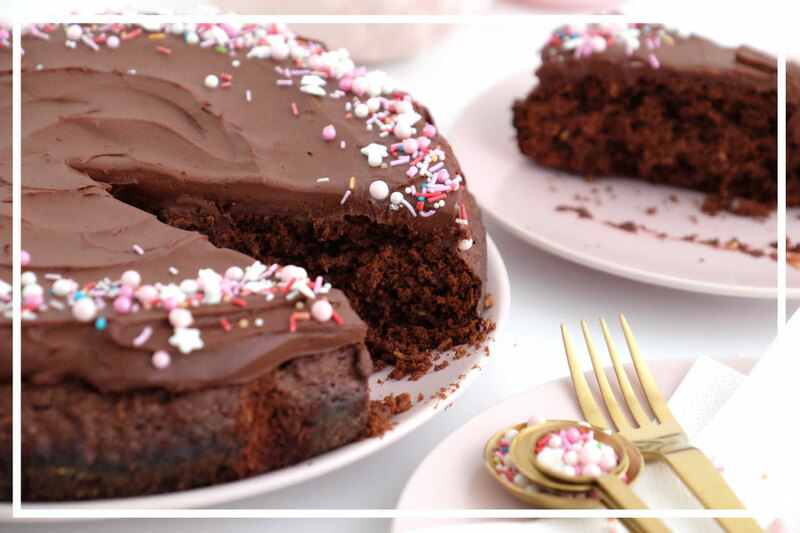 This cake is a match made in heaven: it's so easy to make, takes no longer than 15 minutes to prepare, it's super moist and flavorfoul and in combination with the dairy-free, creamy ganache chocolate frosting this cake will satisfy any chocolate craving! This cake isn't overly sweet because that's how I like it, but if you prefer, you can add a little more sugar. The coconut keeps the cake moist without making it taste overly coconutty. The only thing I would change about this recipe: double the amount of frosting. Or triple it, while you're at it. What can I say? I love a great, easy, no fuss dairy-free chocolate frosting! This is honestly my new go to frosting for any type of occasion, as it suits everyone, no matter their dietary requirements or tastes. I think there's always an occasion for chocolate cake, even if it's not Valentine's Day. 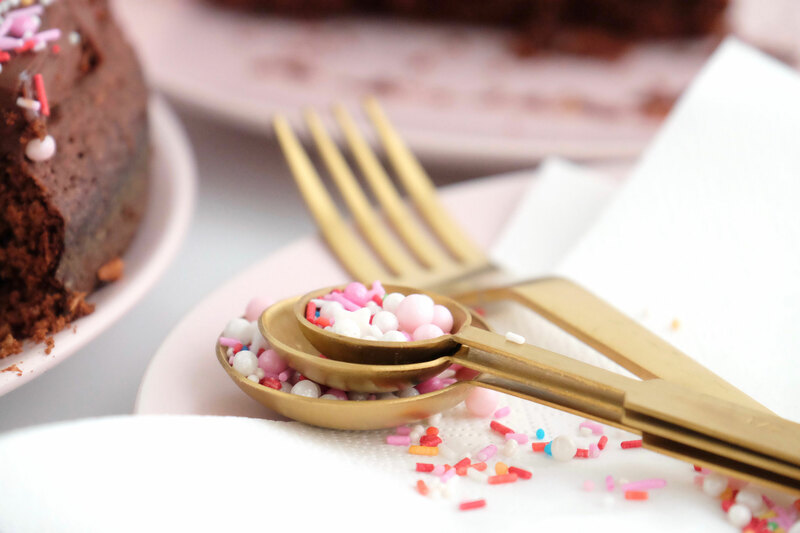 Let's make every day a chocolate cake kinda day. Especially if it also has coconut. Win win! Preheat your oven to 180°C and line the springform pan with baking paper. Butter and flour the pan. Melt the chocolate and the butter over the lowest heat while stirring continously, so nothing burns. Take the pot of the heat, add the sugar and the vanilla extract and whisk together. Add the eggs one at a time and whisk together. In a second bowl, combine the flour, baking powder, salt and coconut and add it to the chocolate. Fold the dry ingredients into the wet. Pour the batter into the springform pan, even it out and bake it for 30-40 minutes (depends on your oven). Insert a skewer after about 30 minutes to see whether the cake is done. After baking, let the cake cool in the pan for about 20 minutes, then release from the pan and let it cool completely on a wire rack. For the frosting: Heat the cream in a pot until it simmers, then take it off the heat and add the chocolate. Let it sit for 1 minute, then stir it together until the chocolate is completely melted and the mixture is creamy. Let the ganache cool down to room temperature for about one hour (or let it rest in the fridge over night). Bevor use, let it come down to room temperature, give it a quick whisk and use a spatula or a knife to spread it one the cake.